KANSAS CITY, Mo. — It'll be a little chilly as runners get ready for the annual 'Rock the Parkway' race on Saturday. But due to this past winter, and the effect on the roads, some may be wondering about all the potholes in the area. KCMO Public Works stated the city has been working with a contractor to resurface the roads along that corridor for the past few weeks. They expect to finish resurfacing by the end of the day Friday. Maggie Green with KCMO Public Works said since December, they've filled roughly 40,000 potholes across the city. "Crews are still doing about five to six days a week, every day out there all over the city patching potholes," Green said. "We filled about 3,700 potholes last week. That's using 170 tons of asphalt and those numbers have been pretty much the same over the last several weeks." With colder temperatures, Green urged drivers to be cautious. 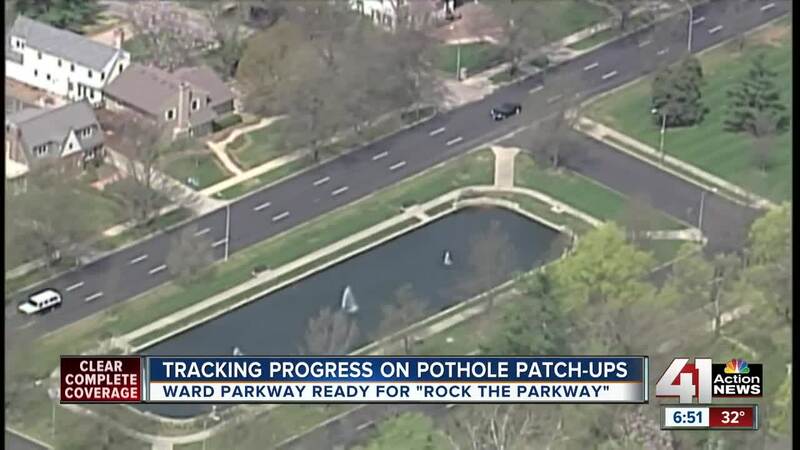 "Any time we have a freeze-thaw cycle, it can impact the road conditions, so the fact that it is going to dip a little cooler this weekend may cause potholes to kind of pop up again," Green said. "And so, you know, it's just a constant battle of the weather versus getting our crews out and patching." Green advised residents to continue reporting potholes that might reopen, the the city can reopen the case and get it repaired again. Besides weather, the department is also dealing with staff openings. "Staffing capacity is a huge component of how much work we can get to with equipment," Green said. "So we're always constantly balancing our resources with the need that we have." Right now the department is finalizing its resurfacing list. "We're looking at things like average daily trips or traffic volume," Green said. "We're looking at potholes. That gives us a story of overall pavement condition, and so that's what we're looking at — the condition of our roadways. And that's how we prioritize our street resurfacing list." Green said that list will be made public by May 1. The department is working on getting contracts through City Council to work on resurfacing roads next year.